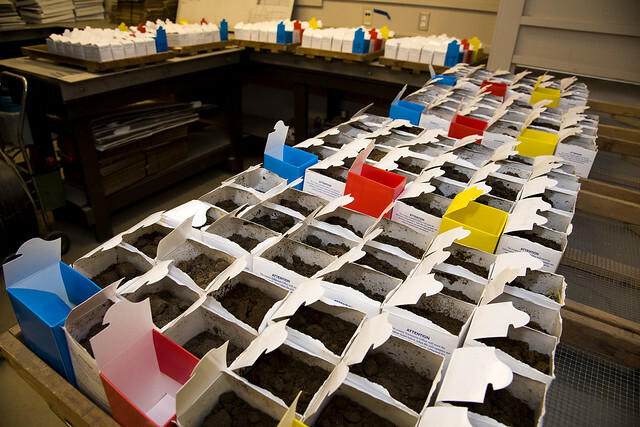 The Soil Testing and Research Lab processes up to 200,000 soil samples each year. MARIANNA, Ark. — It’s after dark and the lights are still on in the University of Arkansas System Division of Agriculture’s Soil Testing and Research Lab. During the peak months — October through November in the fall and January through April in the spring — lab employees are working 12-hour shifts to test thousands of soil samples. The free service helps Arkansas farmers, gardeners, homeowners, golf course managers and others know how to keep their plants green and soil productive. Phil Rozell, who keeps a cow-calf herd on 400 acres west of West Fork, said the Division of Agriculture’s soil testing services helped him turn scraggy hillsides into lush pasture. The soil tests showed Rozell’s fields were acidic, with pH levels around 5.7. Division lime and fertilizer recommendations corrected the acidity problem and identified the nutrients he needed to grow the pasture grasses his cattle need. “We’ve been able to increase production and our cow-calf numbers are up,” Rozell said. Nathan Slaton, professor of crop, soil and environmental sciences and director of soil testing, said the lab processes 160,000 to 200,000 soil samples each year, most of them during the spring and fall periods. A new lab with expanded space and updated equipment has expanded the division’s capacity to process all those soil samples at its facility on the Lon Mann Cotton Research Station outside Marianna. Soil testing is messy science. Care must be taken to prevent cross-contamination of soils from Arkansas’ diverse geology. The samples are frequently moist — sometimes dripping wet — and are dried before testing begins. On a recent rainy spring day, box loads of samples come into the lab’s receiving area where they are opened, paired with paperwork that will follow each batch of samples through the various tests, and dried in a huge, walk-in oven. In an adjacent room, long tables are lined with dried soil samples. Lab technologist Diane Lafex shows how measured scoops are taken from each sample and mixed with a reagent solution that extracts the nutrients from the soil. After precise mixing, the reagent is separated from the soil and burned with a plasma flame by inductively coupled plasma analyzers that measure nutrient levels. Other tests — some automated, others manual — determine pH levels and organic content. At the end of the day, Lafex said, the test results are entered into a program that generates fertilizer recommendations based on decades of Division of Agriculture soil fertility research. The recommendations are sent to the county extension offices for distribution to clients. Slaton said communications technology will soon be upgraded to allow the soil test results to be sent directly to agricultural consultants, some of whom use the data to formulate their own soil amendment recommendations for their clients. In the meantime, Rozell counts on periodic soil tests to keep his pastures green and his herd productive. For more information on soil testing, contact your county extension office. Find your county office here: https://www.uaex.edu//counties/default.aspx.